Barry Lopez’s work has taken him to more than 80 countries over the past 50 years, including some of the most inhospitable places on earth. But on March 9, Lopez is coming home to his alma mater to discuss a topic both timely and close to his heart: the writer’s role in engaging the public on environmental issues. 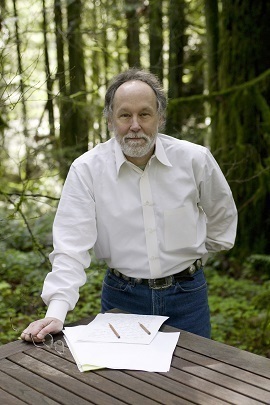 Barry Lopez has spent a lifetime doing breakthrough work in nature writing, but what makes him so exciting is that he does so much more than that, said Laura Dassow Walls, the William P. and Hazel B. White Professor of English. Lopez is the author of Arctic Dreams, for which he received the National Book Award; Of Wolves and Men, a National Book Award finalist, for which he received the John Burroughs and Christopher medals; and eight works of fiction, including Light Action in the Caribbean, Field Notes, and Resistance. His essays are collected in two books, Crossing Open Ground and About This Life. Lopez is a recipient of the Award in Literature from the American Academy of Arts and Letters, the John Hay Medal, Guggenheim, Lannan, and National Science Foundation fellowships, and Pushcart Prizes in fiction and nonfiction, among many other awards. Barry Lopez’s lecture, “The Writer and Social Responsibility,” will take place on Thursday, March 9, 2017, at 101 Jordan Hall of Science at Notre Dame. The lecture begins at 5 p.m. and will be followed by a reception and book signing. It is free and open to the public. The lecture is co-sponsored by the Department of English, the Institute for Scholarship in the Liberal Arts, Notre Dame Research, the Creative Writing Program, ND Energy, the Minor in Sustainability, the Environmental Change Initiative, the Office of Sustainability, the William P. and Hazel B. White Foundation, the College of Arts and Letters, and the Graduate School.